WE ARE ALMOST SOLD OUT! PLEASE CALL THE CHAMBER FOR TICKET AVAILABILITY. 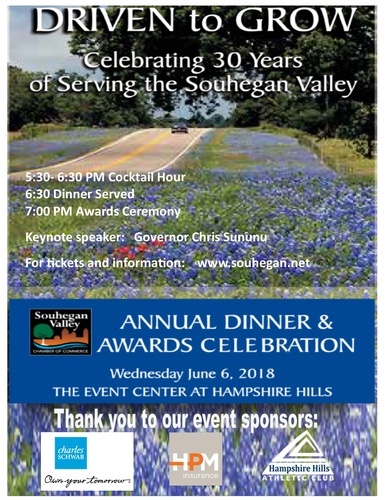 We hope you will join us to celebrate the nominees and winners at our Annual Dinner Awards Celebration on Wednesday, June 6th from 5:30-8:30 PM at the Event Center at Hampshire Hills, 50 Emerson Road, Milford. Our theme for this year is “Driven to Grow,” celebrates the on-going growth and business success in the Souhegan Valley. Besides recognizing the businesses and individuals nominees in the business categories, we will also recognized students from area high schools who are leaders of their schools and plan to pursue higher education in the field of business or entrepreneurship. These scholarships are funded by the Chamber's Leadership scholarship fund. Businesses wishing to be involved may donate to the fund.